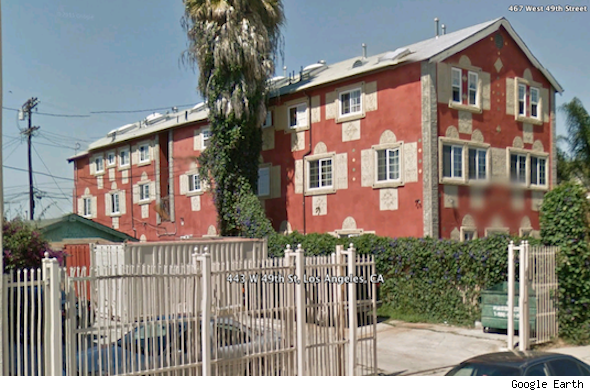 An L.A. landlord who's alleged to have illegally converted a triplex into a crammed 44-unit apartment building has been slapped with criminal charges by city prosecutors, the Los Angeles Times reported. John Callaghan put tenants' lives at risk by not installing proper electrical wiring and enough smoke detectors and fire extinguishers, prosecutors said in a 53-count indictment. 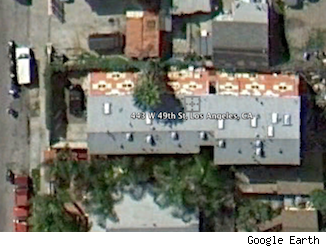 The tenants had filed a complaint against Callaghan to the Los Angeles Housing Department in April 2011. When the agency found violations on the property (pictured), the city handed eviction notices to the tenants, telling them to vacate because of safety concerns. The tenants' lawyers said that the 44 units -- infested with cockroaches and lacking sufficient heat -- had tiny shared bathrooms and kitchen spaces that were illegally installed, according to the Times. The tenants were paying "as much as $500 per unit" and were illegally required to clean common areas, the lawyers added. Last December, the Housing Department ordered Callaghan to vacate the units and pay for the relocation of the tenants. In January, the city council voted to foot the money, which totaled $317,000. The Housing Department has filed a lien against Callaghan's property to recover the funds, the Times reported. According to a press release from the city attorney's office, Callaghan faces a 53-count misdemeanor case and could face up to a $1,000 fine and six months in jail for each violation. The charges against Callaghan also stem from another property in Highland Park, in which he allegedly created 14 rental units from a single-family residence. His arraignment is scheduled for July 31st. Colorado Springs has as experienced only a modest increase in jobs in the past year. Yet rent in the region increased 10.2 percent in the 12 months ending April 31 -- the sixth-largest increase among the 100 metropolitan areas the agency examines. Home prices also increased over the same period by 4.3 percent. According to Realtor.com, the number of listings in the area fell more than 25 percent in the past year, perhaps partly explaining the price increase. Of the 100 metro regions examined by Trulia, home prices in Indianapolis had the second-smallest decline during the recession, losing just 6.6 percent of total value. In the past year, job growth was roughly 1.5 percent, above average for the cities on our list. Compared to rents, asking home prices increased to a much lesser extent of just 1.7 percent, the 32nd-largest rise among the cities examined. According to Realtor.com, list prices as of April 31 were among the lowest in the U.S.
During the recession, home prices in the Warren-Troy-Farmington Hills area of Michigan fell 35.5 percent, among the biggest drops in the country. Recently, however, asking home prices in the region, which is part of suburban Detroit, have recovered rapidly, up 6.9 percent in the past year alone. Compared to homes, however, rent prices have truly skyrocketed in the past year. In the last quarter alone, rent went up 4.5 percent. In the past 12 months, rents are up 11.8 percent. The likely reason for this increase is the 2.5 percent growth in employment in the area, the 10th-highest jump in the U.S. Among the real estate markets to have the largest increases in rent in the past year, no region was more severely affected by the recession. Home prices in the area fell 45.5 percent from peak, the 14th-biggest decline in the country. However, the situation has begun to turn around in the area. Home prices increased 16.1 percent in the past year, and rents rose an estimated 12.3 percent during that time. Job growth is strong in the area at 2.34 percent. The increasing popularity of the San Francisco real estate market is extremely lopsided. List prices for homes actually fell 0.5 percent in the past 12 months. Meanwhile, rent prices increased 13.2 percent -- the second-largest increase in the country. The number of employed people in the city grew just shy of 3 percent in the past year, the seventh-highest rate in the country. Job growth in the Edison-New Brunswick metro area has been modest. Nevertheless, rent in the region jumped a full 15.6 percent in 12 months, by far the largest increase in the country. In the past quarter alone, rent increased 4 percent. Meanwhile, home prices actually fell 4.7 percent, the 11th-largest decrease in the country.